The Union Jack bass owned by Rick Savage of Def Leppard. In other news, I have ordered business cards for this little endeavor. I will soon be including them in shipments. Yay! Posted 06 May 2012. Tagged pendants. How do I order one of these pendants? I learned that a few people were wanting this pendant, so I have added it to my Etsy shop. 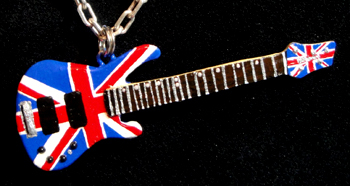 You can find it at etsy.com/listing/99345975/union-jack-bass-pendant.